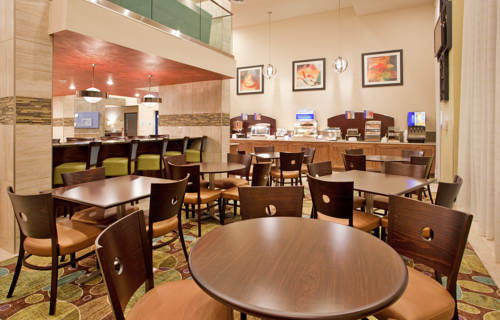 Welcome to Holiday Inn Express Hotel & Suites Branson 76 CentralGuests love the gorgeous Branson views. Holiday Inn Express Hotel & Suites Branson 76 Central has a convenient location on the strip for easy access to everything in Branson. This Branson hotels leisure guests are a short drive from all major attractions and there is certainly no shortage of attractions. Ride roller coasters at Silver Dollar City, bargain hunt at the Tanger Outlet Center or experience the exquisite shopping, dining and entertainment options at Branson Landing. Walmart is next door in case you forgot something, and if you want to see a Branson show, ask our staff about the hotel's ticket packages or services. Corporate travelers appreciate that we have a 24-hour Business Center with print services and a personal computer to assist them with urgent business matters. And, for when you need to impress your special clients, our meeting room with a galley kitchen can help you do just that. Although there is much to do in Branson, the hotel offers great amenities, such as free Wi-Fi access and balcony rooms with terrific views. Taco Bell: Go south of the border for some quick Mexican food at Taco Bell. Branson LandingIn the heart of old town Branson located on Lake Taneycomo find the amazing shopping in a beautiful open-air, waterfornt setting is home to over 100 shops and restaurants, as well as the $7.5 million water and fire spectacular. Thousand HillsThousand Hills does have about that many hills. Well aged course with plenty of hazards and long ball challenges. Dress code. Lunch counter and bar in clubhouse.